FANBOY PLANET.com . 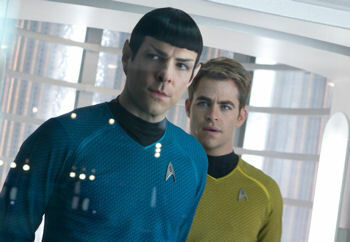 : Star-Trek-Beyond-Salary :. The initial account comes from The Hollywood Reporter, which broke down what's actually happened. Two things -- first, Pine and Quinto just got a big payraise for the third installment, in exchange for being locked in for the obviously untitled fourth. And second, that's only if a fourth movie happens. This wasn't the greenlight we'd all like to hear -- that the new script by Simon Pegg (also playing Montgomery Scott) and Doug Jung has filled Paramount with such confidence that they're already counting the money. The truth is that we don't know. But Paramount executives are smartly hedging their bets. Even though they've likely added $10-12 million to the budget of Star Trek Beyond right at the beginning of production, they've got some sort of budgetary lock on their two stars if there is a next time around. And well they should, because when the two actors were first cast, they were cheap, relatively speaking. 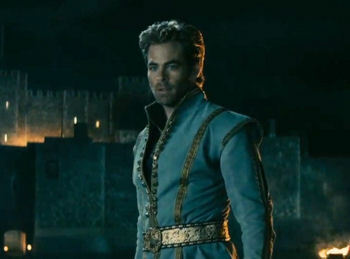 Pine had done some good work in smaller films, but was not on anybody's radar when J.J. Abrams picked him to be Kirk. As for Quinto, yes, even Leonard Nimoy thought their resemblance was remarkable, but his real fame was as Sylar on NBC's drama Heroes. Rumor has it they got paid around $600,000 a piece. Under their initial contract, they were to get relatively restrained raises with each film -- Pine bumping from $600,000 to $1.5 million for Into Darkness and then $3 million for Beyond. But a funny thing happened -- that was based on a contract from 2007. And apparently under California law, you can't have a contract for personal services (as acting is considered) that lasts longer than seven years. And suddenly these actors are a lot more valuable than they were. If the script by Roberto Orci, that he was also slated to direct, had been approved by Paramount, everything would have been fine. But it wasn't approved, and the production got delayed. The studio turned to Pegg and Jung for a new script, and signed Justin Lin (Fast and Furious) to direct, but things still had to be pushed back. The goal right now is to get Star Trek Beyond in theaters in time to celebrate the franchise's 50th Anniversary in 2016. So of course Paramount wants to make sure that they have their Kirk and Spock, who have arguably become as popular in the roles as original cast members William Shatner and Nimoy. Thus Pine will be getting $6 million for this one, with a bump up in the event of a fourth. We can assume Quinto has a similar deal, but that was not included in The Hollywood Reporter's article. The truth is all of these actors have become in demand, partially because of Star Trek. Pine tried another franchise with Jack Ryan: Shadow Recruit, and though it didn't fly, that hasn't dimmed his popularity. Rumor has it -- and please, at this point it IS only rumor -- that Pine is in the running to play Hal Jordan in a reboot of Green Lantern, though he would share ring-slinging duties with someone cast as John Stewart. The real wild card is Zoe Saldana. Is Uhura integral to the franchise? Fans would argue yes, you can't afford to lose any of the main crew for one movie. But Saldana has both Guardians of the Galaxy 2 to shoot, and some day, Avatar 2 and 3. Paramount has to make things pretty sweet for her, too. This happened with the first cast as well. 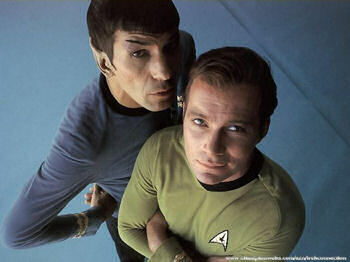 In order to keep Shatner and Nimoy both happy when Star Trek first became a film franchise, the two received "favored nations" clauses in their contract. Basically, if Paramount offered one of them a perk, the other had to get it, too. Thus, when Nimoy directed Star Trek III: The Search for Spock and then Star Trek IV: The Voyage Home, Paramount had to give Shatner the option to direct as well. Their relative abilities as directors may not have been equitable, though there are moments in Star Trek V: The Final Frontier that fans quote a lot, for all their claiming not to like it. All this won't matter much if Star Trek Beyond doesn't work. But there's another one -- if it does, Pegg is going to be much more in demand as a screenwriter, though his best work does seem to be done in partnership with others. All I really want is a movie worthy of that 50th Anniversary.